Samsung may be the world’s largest and most successful manufacturer of Android-powered smartphones, but that doesn’t necessarily mean that the South Korean company is able to deliver immediate on timely Android updates to its devices when a new major version is announced. Such is the fragmentation of the Android platform that even Samsung has to jump through multiple hoops in order to push updates out. Android Nougat was announced months ago, as you will remember, but it’s only now that Samsung has gotten around to actually publishing which of its smartphones will benefit from the update. It doesn’t take a rocket scientist to be able to immediately guess which two devices will be amongst the first to benefit from the Android Nougat update. Like most companies involved in this space, Samsung will instantly be looking to take care of its flagship customers by bringing Nougat to the Galaxy S7 and Galaxy S7 Edge smartphones. Interestingly, Samsung is already in the process of rolling out Android Nougat to the aforementioned devices as we speak, primarily in the European region, but we know it’s out in the wild now. 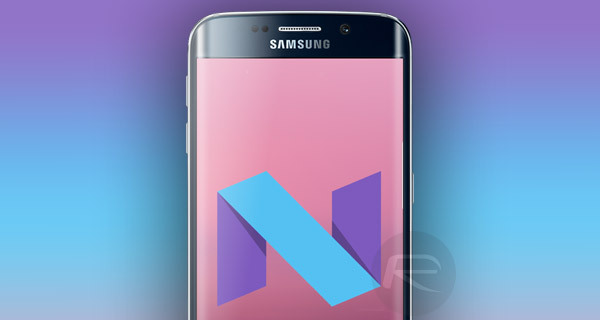 Beyond those two pieces of hardware, Samsung will also be looking to push out Nougat to a number of other devices, with the company promising that the supported devices, or at least an unspecified few of them, will get Nougat “within the first half of the year” 2017. The list only really covers a relatively small portion of Samsung’s available lineup, both smartphone and tablet, but it’s still a decent enough set of devices to get going with. It includes not only a couple of flagship top-end devices, like the Galaxy S7 and S7 Edge, but also some of the lower-level devices that will definitely appease those who simply don’t always make the move to the most expensive boutique device in the range. For those that have a device listed above, it’s definitely something to look forward to, with Android Nougat bringing functionality like Google’s official implementation of split-screen mode, faster app switching, and an overhauled notifications experience including notifications that are bundled together and also conform to quick reply. All in all, a solid update coming to a number of Samsung devices soon, but let’s just hope your carrier clears the way for the update soon. Why is it that android doesnt push updates like Apple does with iOS, pretty pathetic..